Massive discussion forum Reddit‘s subforum for New York City-themed topics, /r/nyc, has a lively and diverse cross-section of New York’s population, with everyone from NYU students, retirees, young professionals, and even police officers. I find the insight one can gain from seeing all these different points of view to be incredibly educational, and sometimes people are, perhaps, a little more candid than they should be. A read through the thread is filled with these and other gems (“Those cops did nothing wrong. ‘pain compliance’ is taught in the Police Academy, punching and kicking are 100% proper tactical procedures…”) and makes blatantly apparent that these officers do actually think that their conduct — getting in a few extra hits than is actually necessary to restrain a suspect — is perfectly acceptable. The problem in the NYPD is not merely a few bad apples, but rather than every apple is exposed to systemic and cultural ideologies that condone tactics that are simply not allowed anywhere in our country, whether it’s stopping-and-frisking black people simply for existing, arresting for contempt-of-cop, or excessive force. Let’s hope the addition of body cameras coming soon brings this issue to light and helps us stamp it out. Has that not been the policy of any government since the age of Gorg the caveman? If you do not kow tow to the authorities they have the right to put you in your place. 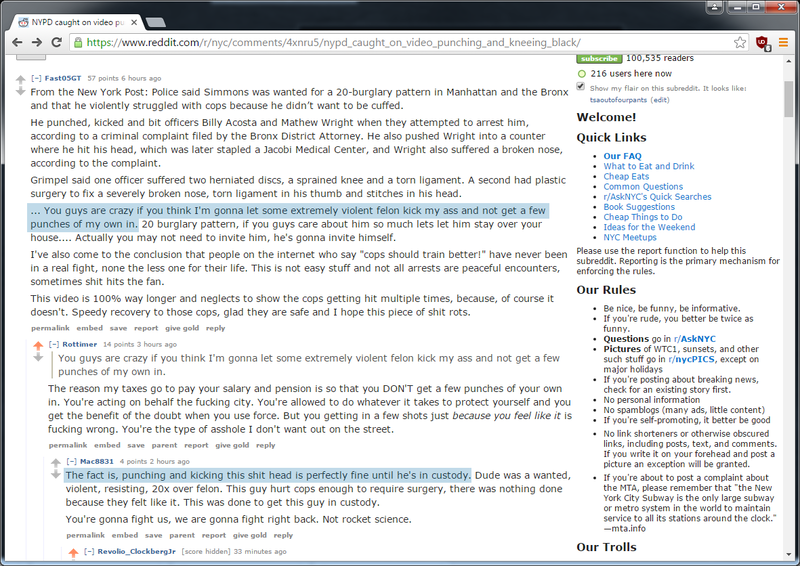 Comment from discussion featherwinglove’s comment from discussion "NYPD caught on video punching and kneeing black suspect in the head". Keep up the good work, Jon!